If you’ve had a busy year and were caught off guard by the fast-approaching holiday and you need to get that Christmas shopping done fast, look no further than EC Pops. 2017 is almost over and Christmas is just a few days away! If you’ve had a busy year and were caught off guard by the fast-approaching holiday and you need to get that Christmas shopping done fast, look no further than EC Pops. We are conveniently located on Main Street in Ellicott City, Maryland and we have gifts for everyone on your list from the young to the young at heart. Stop in and see us today! 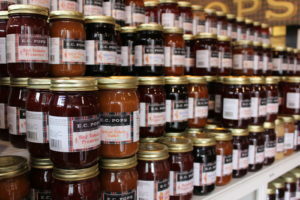 We carry a wide variety of delicious jams and jellies. We have the classic fruit flavors, such as strawberry, blueberry, peach, and blackberry, but we also have some unique flavors you may not have heard of before. Do you enjoy the taste of southern sweet tea? Try some southern sweet tea or peach tea jelly! If someone on your list likes to turn up the heat, we have a variety of mild and spicy pepper jellies as well. While You’re Here, Pick Up Some Webkinz for the Kiddos! If you’re not familiar with Webkinz, here’s a brief lesson. They are adorable, fluffy plush animals. On the animals’ tags, there is a secret code that a child can put in to the Webkinz web site and their furry friend will come alive! Webkinz online has kid-friendly games that the kids can play with their Webkinz animals. Kids want Webkinz this Christmas, stop by EC Pops and pick some up today! When you’re all done your shopping, bring your gifts over to our very own gift-wrapping station. An EC Pops team member will be happy to get them all wrapped up for you, so you don’t have to fight with tape and paper. All you need to do is take them home and put them under the tree. This entry was posted on Friday, December 22nd, 2017 at 1:10 pm. Both comments and pings are currently closed.